Today ATLAS has started the integrated runs. This has happened before, nevertheless this is the first time ATLAS subdetectors get together after the winter break, a lot of work has been done since then. The new settings, after learning from the last year collisions, have been installed in the subsystems, updates on software have been tested, upgrades on hardware have been done. We have the complexity of the subsystems of the Inner Detector, the Calorimeters, the muon systems, the trigger, the data acquisition and some other services that have to be integrated. Part by part with small steps to let the detector synchronize the clocks. Starting from inside to outside of the detector. 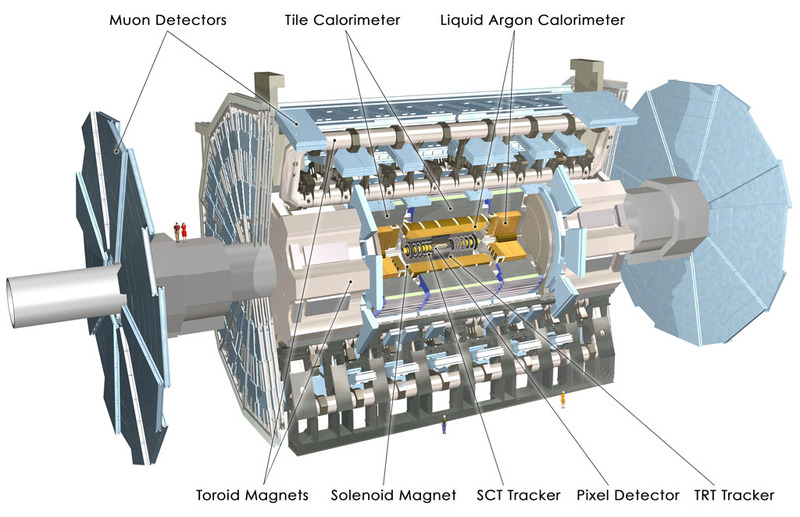 First the inner part of the detector gets integrated: Pixels, SCT, and TRT, then the calorimeters L1Calo, LArg, and Tile. Later the rest. And now running test smoothly. Hoy es el primer día que hay una corrida integrada de ATLAS , es decir todos los subdetectores al tiempo. Después de las vacaciones la gente de los diferentes subdetecores ha trabajado mucho para entender el detector con la información que dejaron las colisiones que se tuvieron el año pasado. Se han hecho cambios en las configuraciones, en los programas, en los visualizadores, y hoy después de que cada subsistema de cada subdetector han probado la estabilidad de estas actualizaciones están listos para integrarse. ATLAS se integra de adentro hacia afuera. Hoy por la mañana, el detector interno (Inner Detector) se integró: SCT, Pixels y TRT. Más tarde vendrán los calorímetros (L1Calo, LArg, Tile), y después el sistema de muones. Postdoctoral researcher working with Sau Lan Wu, from the University of Wisconsin, within the ATLAS (A Toroidal LHC ApparatuS ) Collaboration of the LHC (Large Hadron Collider) at CERN (Conseil Eropéen pour la Recherche Nucléaire). She has collaborated with CMS (Compact Muon Solenoid) LHC (Large Hadron Collider) at CERN (Conseil Européen por la Recherche Nucléaire). She is a scientist in level one of the mexican National System of Researchers (SNI 1). She holds a “Programa para el Desarrollo Profesional Docente” (PRODEP) profile awarded to professors that fulfill efficiently their duties as professor and academic advisor. She has collaborated with three of the biggest international experiments for particle and astroparticle physics: Pierre Auger, ATLAS and CMS. She performed the analysis of very horizontal showers with the Pierre Auger Observatory to search for a deviation of the proton-neutrino cross-section from the standard model. She has done data analysis for the LHC experiments since 2006. She led the first ATLAS publication on the searches for electron-nuetrino final states at high pt, looking for physics beyond the Standard Model.